Massawepie Lake is owned by the Otetiana Council of the Boy Scouts of America, along with the adjoining ponds of Catamount, Round, Long, Horseshoe, Boottree and Pine. Because the Boy Scouts use this area, it is closed to the public from the last week in June to the last week in August. The lake is also the source of the Grass River. There is a footbridge over the Grass River. You can carry over this bridge and float down the river as it leaves Massawepie Lake. There are a couple of peninsulas, a small island, and access to three other paddling locations from this lake: Pine Pond, Boottree Pond and the Grass River. Almost directly across the lake– west from the put-in, is a large peninsula with towering hemlocks and pine needle-covered ground with sunlight filtering through. On the southern end is the access, via separate carries, to Boottree and Horseshoe Ponds. Around a small peninsula to the west lies a footbridge and the Grass River. Further up this finger of the lake will bring you to the carry for Pine Pond. 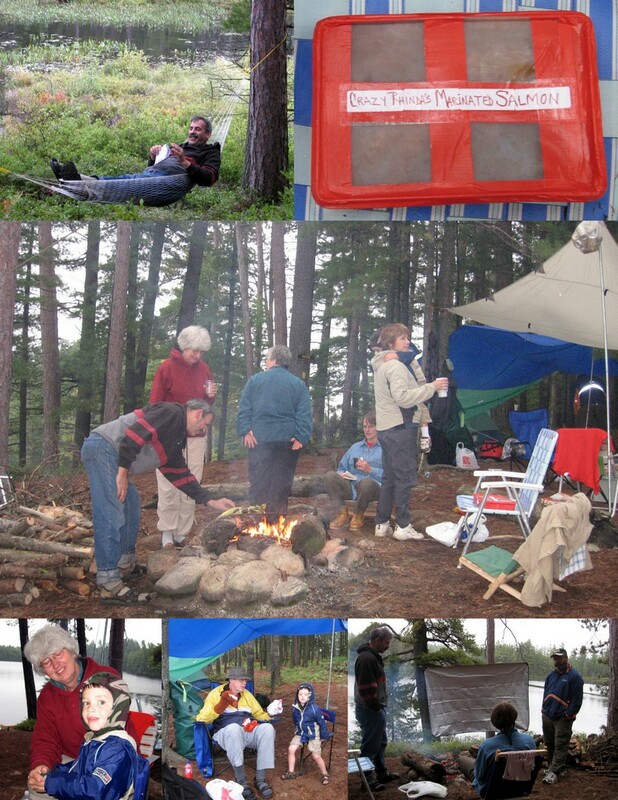 Instead of competing in the Adirondack Canoe Classic 90 Mile Canoe Race Skip & I decided we would arrange for a group camping trip to Massawepi Lake for the weekend of September 8-11. Massawepie is used by the Boy Scouts from Memorial Day to Labor Day so not many people are accustomed to traveling there. Steve, Linda, Bonnie, Cindy, Skip, Kathryn, Eric & I comprised the group. Most of the party left on Friday morning to ensure they could enjoy the beautiful weather on Friday. I was up to my eyeballs writing white papers so I worked on Friday and joined everyone on Saturday morning. It was raining on and off as I drove north and I had a steady rain crossing the lake in my solo canoe. The group was well set up with tents and tarps and certainly well fed. I brought in some of Rhinda’s marinated salmon to be grilled over a campfire. It was cool and damp most of the day but we stayed dry. After dinner Eric and I went fishing and he caught several small bass. This was Eric’s 1st experience in sleeping in a tent and he did great. I think next time we could do even more of a remote experience. The next morning was dry as we packed up and headed out late morning. I left the group and headed to Lake Placid for my week long Leave No Trace backpacking course. Top: Steve relaxes in his new hammock, Rhinda’s Salmon Dinner. Center: Steve rotates the sweet corn while Linda and Cindy warm up their clothes; Bonnie warms up her internals while Kathryn and Eric share a hug around the fire. Bottom: Eric’s 1st camping trip: Jim does a puppet show for Eric; Steve, Bonnie and Skip discuss wind blocks. From Tupper Lake, drive west on Route 3 about 12 miles. Watch for a Massawepie Scout Camp sign on your left. At the sign, turn left onto a gravel road, Massawepie Road, leading to the camp. There is a sign-in area next to the superintendent’s residence after .3 mile. You will go past Catamount Pond, then a parking area on the left. At about .8 mile, there is a put-in on the right. 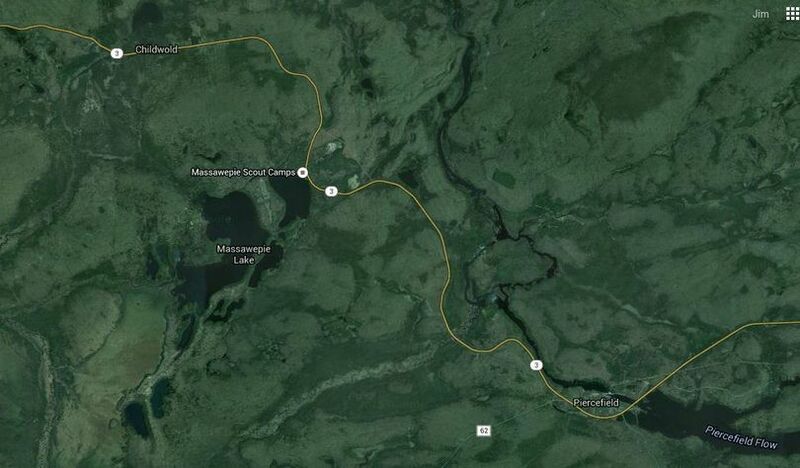 From the west on Route 3 after passing Cranberry Lake and Childwold, the entrance to Massawepie will be on your right, marked by a large camp sign. (If you see Piercefield or Tupper Lake, you went too far! ).